Eats n Feats: Run Wild!! Our daughters are visiting with us this week. It has been quite a while since we have all been together and we are loving every minute of it. They came to this area to run the Phoenix Rock and Roll Marathon with their daddy. Unfortunately, JC is suffering from a bum knee and couldn't run the race, but he enjoyed watching them on Sunday. We managed to see them at miles 6, 17, and 26. It is such a joy to have them here with us!! Of course, they want to see what we old folks have been up to!! They've watched pickle ball, met some of our neighbors, and played with everyone's pets. Monday night we went to the Arizona Opry near Mesa. It is a very entertaining show. Today we went out to the Eloy airport to watch the sky divers. It seems that this is the largest "drop zone" in the world. Then we had dinner at our favorite Mexican restaurant, Borderline in the old town area of Casa Grande. Unfortunately, they will leave on Friday and that time will arrive way too soon!! 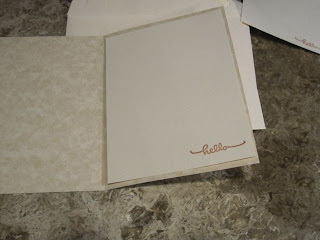 I love this intricately cut mat with the embossed paper. 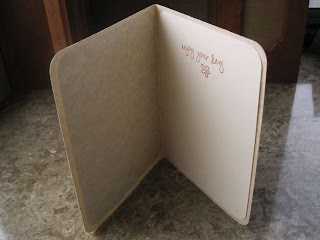 And the inside is so CUTE!! They have really enjoyed picking papers and playing with ways to combine patterns and textures!! 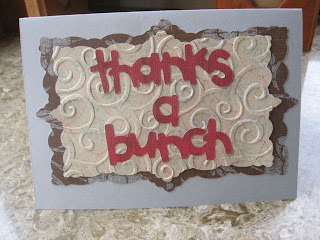 Just look at how well this card turned out from papers the girls thought worked well together. I'm afraid they may be as addicted to this as I am!! Whenever we have any free time, they want me to drag everything out!! I think they really like all my fun tools and gadgets!! Sometimes simple is good. We stamped and colored the image above and matted it with torn paper. 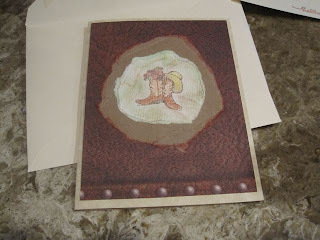 Then we chalked all the edges and found a leather looking paper for the background. The inside sentiment is understated and elegant. This is fun!!! 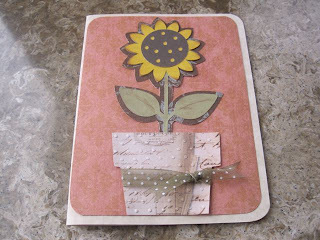 Making cards is so much fun....in fact, I think it is time to pull out all of the materials and toys and start it up again today! :-) Momma is so talented! They are all so pretty! Do you have a Cricut? 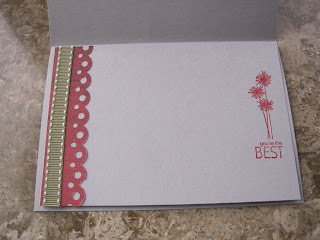 I know that is a machine alot of people who scrapbook use or do you cut everything out yourself? Yep!! I do have a Cricut. I bought it on "black Friday" and I LOVE it! !